The secret is out: Monteverde, Costa Rica is THE place to go if you’re looking for an adventure. So naturally, when Daniel’s mom planned our trip to Costa Rica, Monteverde was high on the list. And boy, am I glad we made it. Monteverde is everything a touristy mountain town in Costa Rica should be. From beautiful hiking trails to coffee tours to ziplining and much, much more, if you have a sense of adventure then you are going to love Monteverde. Just beware the other tourists. We spent two and a half days exploring this beautiful area (so beautiful it now hosts a load of Quakers from the US, but more on that later) and definitely fell in love with it, despite a few ups and downs. P.S. Don’t feed the Coatis. Reptiles, Butterflies, and Birds, oh my! After an amazing first two days in Costa Rica spent in La Fortuna, we were up bright and early for our land-boat-land transfer to Monteverde, Costa Rica. If you know literally anything about me, you’ll know that I am ALL ABOUT boats. So the fact that most of our time in transport would be on a boat (as opposed to the winding, pothole-riddled roads) was a-okay with me. The land-boat-land transfer from Arenal to Monteverde involved a twenty-minute ride from our hotel to Lake Arenal, about forty blissful minutes skirting around the edge of the lake and looking at wildlife, and another hour or so of torture on the aforementioned roads. The drive from Lake Arenal up to Monteverde was probably the WORST offender when it came to terrible roads. Just a fair warning on that front. I would definitely pop a motion sickness pill if I were you. On the whole, though, the time we spent on the road on a land-boat-land transfer was FAR preferable to the four hours of driving around the lake that it would have required to get to Monteverde. I definitely recommend it. We went with Ride CR and they were super professional and had great service. They charge $50/person for a shared land-boat-land transfer from Arenal to Monteverde, which I think is totally reasonable. The drive up to Monteverde was also the first time we set eyes on the legendary Coatis. 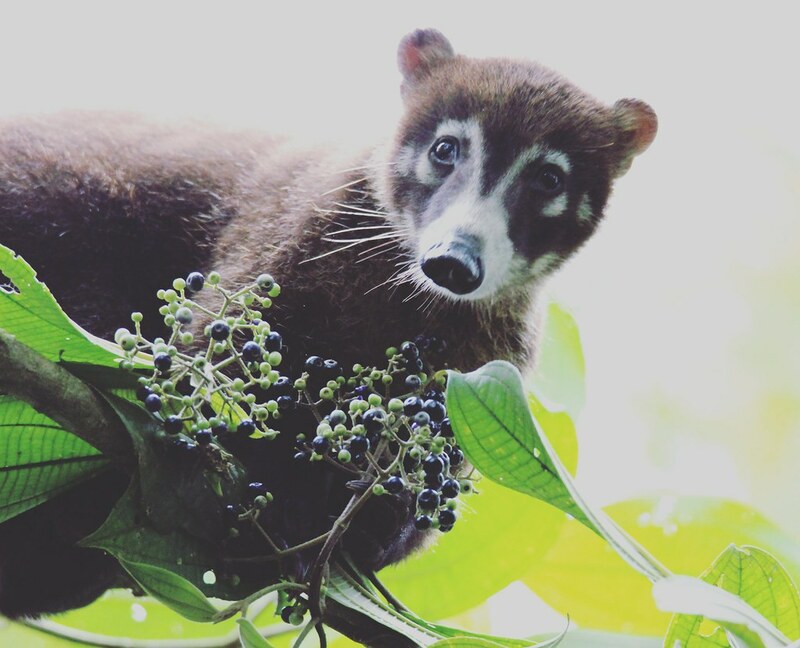 These cute little animals are basically the South and Central American version of raccoons. We nearly ran over the tourists who were on the side of the road, feeding them and trying to get the perfect shot for their Insta. Pro tip: feeding wildlife is a bad idea. Don’t do it. Upon arriving in Monteverde, we went straight to our hotel: The Hotel El Establo, located just outside of town. Perhaps the most surprising thing about Monteverde, Costa Rica is the fact that it has a rich Quaker history. During the Korean War, many Quakers relocated to Costa Rica to avoid the draft (Costa Rica does not have a military). Most of them settled in Monteverde. They set up the Monteverde Friends School, which is nowadays a bilingual school for both Quakers and local Costa Ricans, as well as the Monteverde Cheese Factory. Linda, Michael, and Isabel (aka everyone in Daniel’s family except for him) all went to a Quaker university (despite not being Quaker). So this was one fun fact that definitely drew them to Monteverde. The Hotel El Establo is also run by a Quaker family, and the fact that it was a family business was clear from the very start. Emma, who was probably about ten, was off school for the holidays and running around like she owned the place. She also showed us some really cool pug pictures on her i-Pad. Since our rooms weren’t yet ready for us and we hadn’t eaten since breakfast, we decided (or our stomachs did) that it was time for lunch. One of the girls at the front desk recommended a place called Sabor Tico to us. She promised that it was only a short walk from the hotel (lies), so we set off. The sun was beating on our necks and we hadn’t actually looked up how long it would take to get to Sabor Tico. So we were hangrily trodding along for a good while before finally reaching the edge of town and the aforementioned restaurant. Fun fact: it takes longer to get from one place to another by walking than it does by car. Who knew, right? That being said, Sabor Tico was a practical oasis compared to the humidity of the Costa Rican wet season. Tucked away at the end of a second-floor balcony inside of a random mall on the side of the road, we never would have found it on our own. The mix of locals and tourists we found inside meant it was clearly a popularly recommended place—and for good reason. Of course, since we were absolutely starving we weren’t exactly the most rational of judges. But I have to say that the food there was pretty dang delicious (and reasonably priced). In fact, we returned there on our last night in Monteverde, it was just that good. The rest of our afternoon was spent settling into our new home for the next few nights, unpacking our things, and watching Netflix as we sunk into our super comfy beds. Feeling too lazy to make the trek back into town, we succumbed to the prices of the on-site restaurant and ate there for dinner. More than half of us indulged in Bailey’s-drenched brownie sundaes. Those sundaes made us pretty sure that we were in heaven. Our official first day in Monteverde, Costa Rica was honored with a late start and a delicious buffet breakfast. At noon, we were picked up for the coffee tour that had been arranged for us. Now, to be perfectly honest, I was not a fan of this tour. Having been on an absolutely fantastic tour of a coffee farm in Boquete, Panama last winter, I had some pretty high standards going into it and wasn’t exactly impressed by what we encountered. From the very start, it was clear that this was a farm that was mostly geared towards tourism, rather than the actual production of coffee—so much so that it actually marketed itself as a 3-in-1 tour of coffee, chocolate, and sugar cane despite really only producing coffee. That probably should have been our first warning sign. The tour involved a number of stations which showed the various stages of coffee production. This included a section where we picked coffee cherries ourselves—making it into a novelty, despite the fact that they were pretty transparent about how they pay the actual pickers pretty shiftily. As we learned, coffee pickers are paid by the cajuela, or box, which is industry standard. The pay per cajuela is about $1, and a good picker can pick perhaps 15 cajuelas/day. That equates to $15/day, and that’s just for the BEST pickers. The pay is in fact so bad that Costa Ricans refuse to work as pickers. Most coffee pickers in Costa Rica are actually migrants from Nicaragua and Panama, who only come for the coffee picking season and then move back to their home countries. I really have mixed feelings about how this was presented. Although the tour was perfectly transparent about what they pay their workers, it almost seemed like they were proud of getting away with it. It was really weird. Plus, knowing that a different model is possible (the Finca dos Jefes in Boquete pays their workers by the hour), this makes me seriously angry. Now, I know it’s not totally reasonable to compare two completely different organizations in two different countries. But when you think that Costa Rica is the economically more successful of the two and that this coffee farm we visited was clearly a big operation, I’m pretty sure they can pay their workers better. So long story short, I had a sick to my stomach feeling this whole tour. I definitely wouldn’t recommend it. I’ll go more into Monteverde coffee tours that I do recommend later, in the itinerary section of this post. Want to do something about the unfair wages in the coffee industry? Be sure to buy only direct or fair trade beans (here’s an awesome infographic about the difference between the two)! After we were back from our disappointing coffee tour, we grabbed lunch in town. Then, went back to the hotel for a mid-day rest (necessary in Costa Rica). After we had our energy back, we called a cab to take us to the outer edges of Monteverde. Our first stop was the Monteverde Cheese Factory, where we were able to look through the window at the cheese production process before buying some cheese for our in-room picnic later that night. From there, we walked down the road to CASEM, or the Cooperativa de Artesanas de Santa Elena y Monteverde. This awesome cooperative focuses on supporting local women artists. It is an AWESOME place to buy souvenirs. Linda bought a small, felted toucan there for her mother, who loves birds. It was super cute, and looking back on it I definitely wish I had bought one for myself (even though we learned from the bird feeder at our hotel that toucans are total bullies). On the same stretch of lawn you can find the Monteverde Coffee Center and Monteverde Whole Foods, which sells pottery by local potter Lorna Smith. I bought a small jar that was painted every shade of blue I love. It now lives happily in my bathroom, brightening up my morning routine every day. We also bought two loaves of bread from the bakery across the street. Then we called a taxi and retired to our rooms, where we indulged in a light picnic of our fresh bread and cheese for dinner. Honestly ideal. Our next (and final day) in Monteverde was set to be a big one, and we had to set off early in order to fit in everything that we wanted to. Number one on the agenda was a hanging bridges tour in Selvatura Park (for me and Linda). Daniel, Isabel, and Michael, who don’t like heights visited a reptiles, butterflies, and birds exhibit in the same place. We met our guide, Tony, and six Swedes in the reception area before heading out on the hike. Tony decided to start from the end of the trail so as to avoid most of the crowds. I wasn’t really sure what to expect as far as physical exertion went, but the path was pleasantly flat most of the way. It was easily doable in my post-Christmas holidays shape. Phew. Tony was invaluable along the way, as was the giant telescope that he was toting along. He pointed out more crazy birds than I’ve maybe ever seen in my life, and we even managed to spot both a male AND a female quetzal bird at different times during the hike. I was out of my mind when that happened. Seeing the cloud forest from above was another amazing part of the hanging bridges hike, though a little bit disorienting. Fair warning: looking down is not for the faint of heart. Since it was our last day in Montevertde, we wanted to try and see EVEN MORE cloud forest while we still could. So we did. Which, looking back on it, might not have been our smartest idea in the world. Sure, there was no full-blown travel fail during our hike in the Moververde Cloud Forest Reserve. But the heat and humidity can get to you pretty fast in Costa Rica. We probably could have used a bit more of a rest than we actually gave ourselves. Oh, and we forgot to put on bug spray. You know how well that went for us. That being said, the Monteverde Cloud Forest Reserve was absolutely g o r g e o u s. It was totally worth the taxi ride and vague sense of exhaustion that came with it. As one of the first times in Costa Rica that we were exploring without a guide, too, that sense of freedom we are all so used to was definitely palpable. This was also where we learned that, apparently, Coatis can climb trees. Who tf even knew??? That evening, we made our long-awaited return to Sabor Tico, where we gorged ourselves on our last proper Costa Rican meal. The food lived up to the hype of our memories. We also stopped by the Monteverde Glass Art Studio. There, we bought some of the cutest glass sloth ornaments we have ever seen, straight from the artist himself. As we settling down for our last night in Monteverde, Costa Rica, the sun bid us goodbye with one of the most striking sunsets I’ve ever witnessed. A beautiful performance of reds, oranges, and yellows, which faded to the blues and purples of night. I, naturally, set up a tripod and made Daniel take disgusting couple photos with me. By now you probably know that I wasn’t exactly the biggest fan of the Monteverde coffee tour that we went on. So why am I recommending that you take one anyway? Because the coffee tour we went on (steer clear of Don Juan, by the way) isn’t the only one in Monteverde. After having such a terrible experience, I went back and did some more research. And I can’t believe that we didn’t take the coffee tour offered by Cafe Monteverde. Unlike the Don Juan Coffee Tour that we took, the Cafe Monteverde Coffee Tour seems to actually be a reasonable operation, with a focus on sustainable and organic farming and actually paying their workers fair wages. In fact, all proceeds from their coffee tours go directly towards supporting the local farmers and their families. Talk about an awesome operation. Monteverde and Costa Rica in general are known for their coffee, so don’t miss out on taking a coffee tour while you’re there. Just do a bit of research ahead of time to be sure that you’re supporting a good operation. Although I don’t have personal experience with them, the reviews are back and I think the Cafe Monteverde Coffee Tour is definitely the way to go. If you only eat out once during your time in Monteverde, make it at Sabor Tico. It’s so good, we went there twice in two days. Seriously, just go. After an early start to the morning, a chill afternoon is always a good idea. Why not spend this one exploring downtown Monteverde and the surrounding area? This is also a great time to do a bit of shopping if that’s your thing. CASEM — CASEM stands for the Cooperativa de Artesanas de Santa Elena y Monteverde. It’s a great place to buy arts and crafts made by local women. Monteverde Whole Foods — This might seem like an odd place to buy souvenirs, but the Monteverde Whole Foods is the only place in Monteverde that sells local artist Lorna Smith’s pottery. I think it’s absolutely beautiful. It’s also right next door to CASEM, so why not stop by? Monteverde Glass Art Studio — If you go one place for souvenirs in Monteverde, make it the Monteverde Glass Art Studio. Located right in the center of town, you can watch Angel blow glass into a multitude of amazing things right in the store, and they’re all beautiful. You can also often find his work being sold at the entrance of the Monteverde Cloud Forest Reserve. Literally Any Grocery Store — if you’re looking to pick up some coffee while you’re in Monteverde, don’t fall for the steep prices at a souvenir shop. You can buy locally produced coffee from any grocery store in town for much cheaper! For more suggestions on where to go shopping in Monteverde, I found this site to be an invaluable resource. While I had loads of fun splitting my day between two different parks (sense my sarcasm? ), I think it actually makes loads more logistical sense to focus your energy on one place for your second day in Monteverde: Selvatura Park. Any package that you book through their website (and there are loads) includes transportation from your hotel. So even though it’s far out, there’s no need to worry about getting there! Start your morning off with a guided hanging bridges hike in Selvatura Park. Definitely go with the guided tour if you can afford it. Our tour-mates the six Swedes said they had done the hike a few years before without a guide and seen absolutely no wildlife. With a guide, we saw LOADS, so it’s definitely worth the money. Be sure to look down! It’s not every day you get to see the tops of the trees in a cloud forest in Costa Rica. Once you’ve finished your hanging bridges hike, there are loads of other options to fill your time with in Selvatura Park. I suggest checking out their various nature exhibits. Although I can’t speak from personal experience, Daniel, Isabel, and Michael all had glowing reviews about the reptile, hummingbird, and butterfly exhibits. PRO TIP: This Eco Adventure Package includes transportation from your hotel, a guided hanging bridges hike, entrance to the butterfly and hummingbird gardes, AND lunch! Pension Santa Elena — Pension Santa Elena is located smack dab in the middle of town, so it really is the perfect place to base yourself. Every time I walked passed it, I got so jealous of the guests just chilling out on their porch. Prices start from $14/night for a shared dorm. Cabinas Vista Al Golfo — It’s hard not to have a good view in Monteverde, but the Cabinas Vista Al Golfo definitely have a winning one. For the extreme budget traveller, there is a 19-bed dorm. All of their private rooms are STUPIDLY cheap as well, especially for Costa Rica. Rainy Days B&B — I also walked passed the Rainy Days B&B quite a few times and it definitely looks like a cozy place. There are two 6 bed dorms, so it’s a small, close-knit place. AND there are free home cooked breakfasts every morning! Definitely bring a backpack along to Monteverde! Hiking Boots — Even if you’re not a big hiker, you HAVE to hike while you’re in Monteverde. Bring along sturdy shoes for this. If you’ve been thinking about investing in a pair of hiking boots, now is definitely the time to do so. I’m obsessed with my Ahnu Sugarpine Boots and highly recommend them. Here’s a pair by the same brand for men. Rain Jacket — Monteverde is best known for its cloud forest, so you can bet that it will rain while you’re there. Be sure to bring a rain jacket along to keep you nice and dry! Athletic Leggings — Since Monteverde is pretty high in elevation, I would suggest packing longer athletic leggings or hiking pants. It can get a little bit too chilly for shorts. Sweatshirt or Lightweight Jacket— Layers are generally a good plan in Monteverde. It can be a little bit cooler in the mountains than, say, at the beach. Pack a lightweight jacket or sweatshirt so you don’t get too cold. Motion Sickness Pills — if you pack one thing for Monteverde, make it motion sickness pills. The roads here are winding and full of potholes. You’ll thank me later. Daypack — Monteverde just isn’t the place for your designer leather handbag, guys. Instead, bring along a sturdy backpack like this one which can hold everything you need for the day. Reusable Water Bottle — save some money by bringing along a reusable water bottle like this one. Tap water in Monteverde is perfectly okay to drink! Sunglasses — protect your eyes, bring sunglasses! If you don’t know where you put your last pair, you can browse men’s and women’s sunglasses on Amazon. Sunscreen — even if it’s a bit chillier in Monteverde than in other parts of Costa Rica, remember that you’re also closer to the sun! If you’re like me, and burn after two seconds outside, you’ll want to be sure to bring some sunscreen along. And to keep it on you at all times. Bug Spray — Monteverde is definitely home to a few bugs, so bringing along bug spray on your hikes—and then remembering to put it on—is definitely a good plan. Travel Towel — Most hostels in Monteverde provide towels, but only at an extra charge. This is the case throughout much of Central America, so you might want to consider investing in a travel towel to save some money! Here’s a great one! I think we may have done the same coffee tour (we definitely stayed in the same hotel as you!) but from what you’ve said, I think it’s the same tour. I felt the same as you. I was looking forward to the tour as I thought it would be a unique experience but it was totally geared towards tourists. The tour guide was friendly and very helpful (I’m a wheelchair user) but I wouldn’t recommend spending time on this looong tour when there is so much more to do! The tour was definitely pretty disappointing 🙁 Glad to hear they were helpful with wheelchair access at least! I can’t even say how much this is making me want to go to Costa Rica!!! Do it!!! It is so stupid beautiful there (and there are sloths).